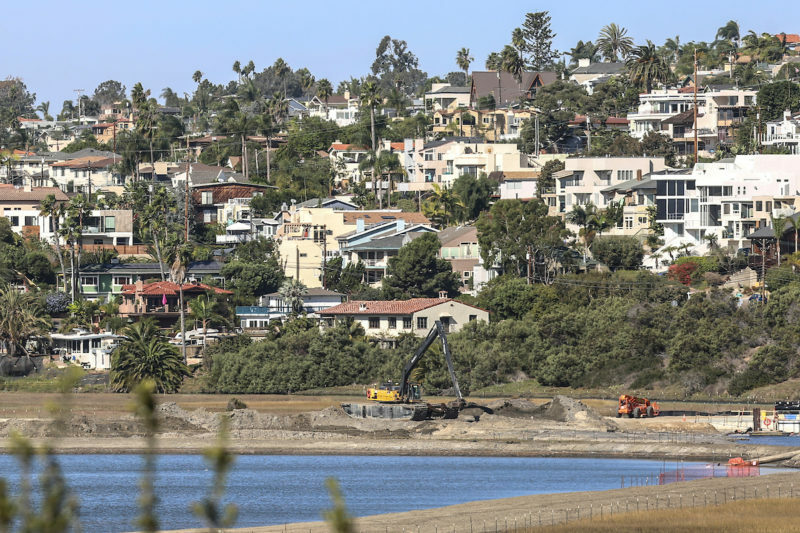 A San Diego County Superior Court judge on Wednesday temporarily suspended an Encinitas law that gave voters final say over land-use decisions and prevented the city from putting a state-mandated plan in place for affordable housing. Twice since 2016, the Encinitas City Council has attempted to comply with California housing laws requiring every city to identify sites for development. Leading opponents of those plans, who feel their community is growing at an alarming pace, argued that potential new buildings would be too tall and too closely bunched together, and they expressed skepticism that the affordable units were ever get built. The housing plans don’t mandate that any new housing will actually be built, only that cities identify possible sites where it could go. In court last month, various interests for the city, tenants and developers all agreed that the local law — an initiative approved in 2013 as a check on officials — was the source of the impasse. Superior Court Judge Ronald F. Frazier ruled that Prop. A should be pre-empted by state law for the current housing cycle, which stretches from 2013 to 2021. California requires that every eight years, cities identify possible sites that could accommodate a growing population and provide affordable housing options. Frazier declined, however, to suspend Prop. A for any housing cycle beyond that, arguing there could be circumstances in the future when the local law doesn’t prevent the city from making major land-use changes required by the state. Bruce Ehlers, the primary author of Prop. A, did not immediately return a request for comment. Frazier gave the city 120 days to craft a housing plan that with the approval of the California Department of Housing and Community Development. Attorneys for Encinitas had asked the court to order Measure U, the housing plan that failed at the ballot box in November, into law, but Frazier declined. He also declined to provide any specific guidance on the scope of the city’s plan and where the new units should go. But he left open that possibility and others — including a halt to all building permits in Encinitas, which had been proposed by attorneys for low-income tenants, as a punishment for continuing to defy state law. Encinitas Mayor Catherine Blakespear told Voice of San Diego that the ruling was reasonable, because it recognized both the people’s right to vote on land-use matters and the impasse that had occurred. She also said she appreciated the clarity the judge provided about needing California regulators to sign off on a housing plan in advance, sparing the possibility of further litigation on the question of whether the plan was legally adequate. Blakespear said she intends to get the city into compliance with the court’s requirements by the deadline. And then start the process all over again. Rafael Bautista, the lead organizer for San Diego Tenants United, which represents renters and is one of three groups that sued Encinitas over its lack of housing, called the ruling a victory. He, too, thought the judge’s requirement that California regulators review the 2013-2021 housing plan upfront would spare everyone over the long term. “That feels good,” he said. The ruling, of course, does not guarantee that any group, including the Building Industry Association, won’t again drag Encinitas into court in the next housing cycle. Amid a statewide housing crisis, the state is putting increasing pressure on cities to build more units, more densely. Building Industry Association CEO Borre Winckel said the ruling should be interpreted as a warning to cities that want to thumb their noses at state housing requirements.